Military police have arrested 31 members of the Italy's powerful Casamonica mafia in a series of raids across the country today. The huge operation involving 250 carabinieri — Italy's military police — included the arrest of one of the alleged heads of the organised crime unit Giuseppe Casamonica, local reports said. 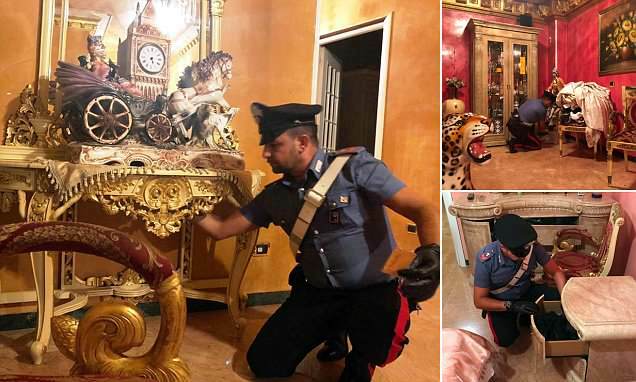 Photos show officers leafing through expensive-looking goods in gaudy properties with gilded and marble furniture. The raids took place in parts of Rome, as well as Reggio Calabria and Cosenza further south in Italy. Searches turned up 50,000 euros in cash, current accounts, cars and dozens of luxury watches. The Local said Giuseppe Casamonica, who was released after a 10-year prison stint earlier this year, was arrested along with former champion boxer Domenico Spade, whose gym in Rome was also shut down and seized. Police have issued warrants for six other associates believed to be on the run. The group's crimes, which include racketeering, have been carried out with 'mafia character' punishable under the Italian penal code. Most recently, Antonio Casamonica and his cousin Alfredo Di Silvio were wanted in relation to a bar attack which included assault on a young disabled woman.